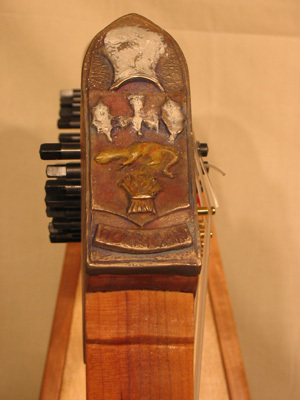 Named the Mary Kate, this instrument was patterned after the Queen Mary Harp which was reputedly owned by Mary Queen of Scots and dates from the 16th century. 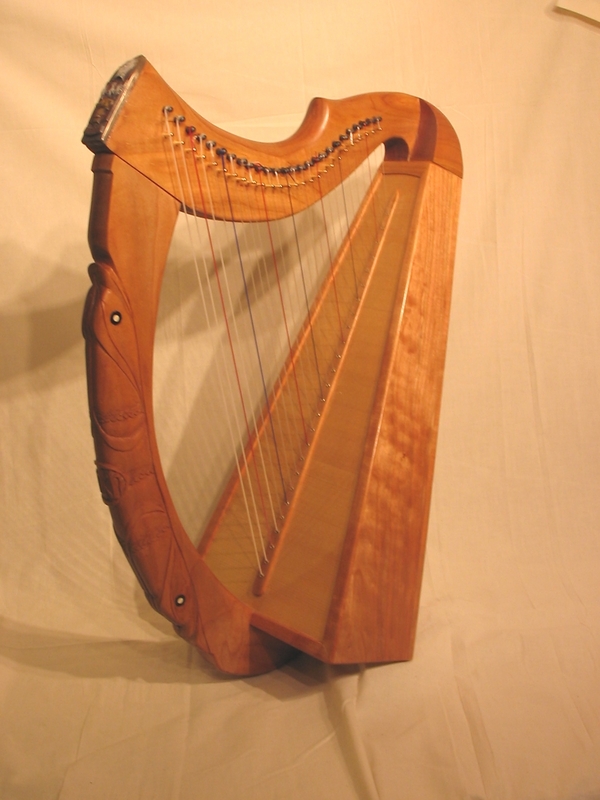 She is the best survived harp from the three extant instruments from the Late rennaissance and is reckoned to be an excellent example of Celtic harp construction and decoration of this period. The object of this commissioned project was to create an authentic Ancient Celtic harp, regal and personalized, in heirloom quality and faithful to the construction methods of the original maker. To this end the Mary Kate had her forepillar carved with the likeness of leaping salmon, the initials MKH and some braid were included in the design. The bronze finial depicts the Horrigan coat of arms and is cast in bronze. 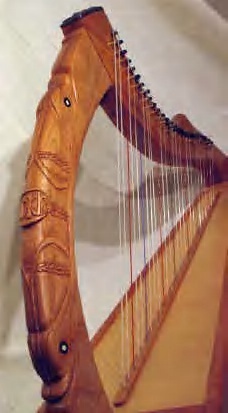 The body of the Mary Kate harp is constructed from flamed black cherry with a sitka spruce soundboard.Neck and forepillar are also of cherry. Eyes of the salmon are inlaid with bone and ebony. There are 26 strings. She stands 32″x23″x13″ at her widest point. Hannah Lin added to this collaboration a case of fine wool weave and a hand bound book of of harp stories and music compiled by the client. A most interesting collective project involving the gentle input of three creative minds.